Northern Quebec overflows with mineral resources whose development could generate substantial economic activity. To derive benefits from these resources successfully, businesses, the government and local communities—many of which consist of Aboriginal populations—must collaborate in order for everyone to have an interest in the economic success of development projects. The goal of this Economic Note is to describe this collaboration model, which encourages and facilitates development in Quebec's north while respecting Aboriginal communities and forming partnerships with them. This Economic Note was prepared by David Descôteaux, Public Policy Analyst at the Montreal Economic Institute. Northern Quebec overflows with mineral resources whose development could generate substantial economic activity. To derive benefits from these resources successfully, businesses, the government and local communities—many of which consist of Aboriginal populations—must collaborate in order for everyone to have an interest in the economic success of development projects. In this regard, the Cree of Quebec have demonstrated over the years that it is possible to develop natural resources in such a way that everyone benefits, among other things by joining with companies to become stakeholders in development projects, invested in their success. The goal of this Economic Note is to describe this collaboration model, which encourages and facilitates development in Quebec’s north while respecting Aboriginal communities and forming partnerships with them. The “Plan Nord” announced by the Quebec government in 2011, to be rolled out over a period of 25 years, aims specifically to seize the opportunities offered by the development of northern Quebec’s resources. (1) It anticipates the public and private investment of many billions of dollars for the development of mineral resources and the construction of transportation infrastructure. On this territory, which covers 72% of the province of Quebec, there are over 120,000 inhabitants, including 33,000 Aboriginals belonging to four First Nations: the Cree and Inuit in the Northern Quebec region, and the Naskapi and Innu living in the North Shore region (see Figure 1 on iedm.org). The Cree Nation, composed of some 16,000 people, already participates in certain mining projects and has benefited in recent years from the development of natural resources in the James Bay region. Not surprisingly, the standard of living in this Nation is among the highest of Quebec’s Aboriginal peoples. It is the openness of Quebec’s Cree Nation to resource development that explains, at least in part, its economic dynamism. The signature of the “Paix des Braves” (the Peace of the Braves) between the Quebec Government and the Grand Council of the Crees in 2002 was a major turning point. (2) This agreement, which aimed to encourage Cree and non-Cree organizations to collaborate in developing the territory’s resources, transferred to the Cree the administration of a certain number of domains that used to be the responsibility of the Quebec government like social services, employment and economic development. It granted to the Cree an annual, tax-free payment of $70 million, indexed to the increase in the value of natural resources development. (3) The agreement allowed for the hiring of Cree workers by Hydro-Québec and by natural resource development companies. The Paix des Braves also reserved a portion of contracts for Cree businesses and stipulated the payment of royalties from Hydro-Québec. An agreement like the Paix des Braves, by reducing the risk of conflict and by setting up a sound arbitrage process for determining the best locations for mining projects, avoids the “not in my backyard” phenomenon and maximizes the economic gains both for Aboriginal communities and for Quebec society as a whole. The current controversy regarding the Strateco Resources uranium exploration project (the Matoush project), located north of Chibougamau and of the Cree village of Mistissini, highlights another important factor in the success of development projects, which is however more a matter of law than economics, namely its “social acceptability.”(9) This project, which Quebec’s office of environmental hearings (BAPE) was looking into at the time of writing, is contested by numerous groups and is subject to a moratorium. For resource development to take place to everyone’s benefit, governments, companies and communities must all make an effort to find some common ground, within the existing legal framework, in order not to jeopardize development projects in general. Certain recent agreements, involving the Cree among others, go further in the merging of economic interests. They contain the usual clauses regarding royalties, the hiring of local workers and contracts reserved for local businesses, but they also give the Aboriginal community a more direct financial stake in the economic success of the project. The more that local communities become stakeholders in development projects—whether by becoming shareholders or by signing agreements that provide gains for the community that increase at the same rate as the profits of the company—the more there is a convergence of interests for all the parties involved, and the greater are these projects’ chances of success. The Paix des Braves agreement, and the subsequent private contractual agreements with development companies, have been beneficial for Cree communities. Canadian Aboriginals in general have lower average incomes than the non-Aboriginal population. (14) Their participation in the labour market is also lower than the rest of the population. Federal government data show quite a different situation, however, for the Cree of James Bay since the Paix des Braves. In Eeyou Istchee, the name of the Cree territory in the James Bay region, the employment rate went from 46% in 2001 to 55.2%(15) in 2006 (latest available data),(16) surpassing the average of other Aboriginal communities. 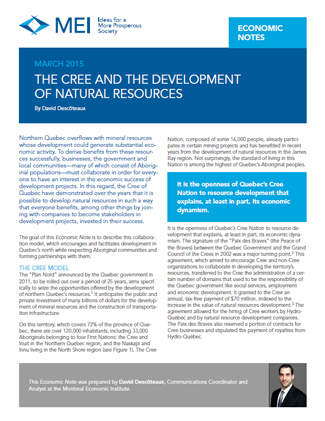 This economic activity stems from the royalties that the Quebec government awards to the Cree, from the entrepreneurial spirit of the members of this Nation, but also from the development of resources. Because without Hydro-Québec’s numerous hydroelectric projects, there would undoubtedly have been no Paix des Braves, and no royalties. Along the same lines, Aboriginal communities will be able to benefit from the development of natural resources, including mineral resources, in northern Quebec in the coming years. It is true that the prices of many metals have fallen in recent years, which has called into question the viability of certain mining projects. But the prices of natural resources are by nature cyclical, and the industry is expecting them to bounce back, stimulated by an eventual global economic recovery. For the development of natural resources in Quebec’s north to expand, and benefit a greater number of people, the government and companies will need to embark upon new projects while being sure to involve Aboriginal communities. The more that local communities are invested in development projects, the greater will be the chances of success of those projects. This development model, in which the economic incentives of all of the parties are aligned, holds much promise for the future. The example of the Cree is revealing. This Nation has generally been favourable to natural resource development projects that generate revenues, jobs and business opportunities. The agreements between the Quebec government and the Cree, and especially the Paix des Braves, have stimulated the economic and social development of these communities. Today, the Cree are also financial partners in numerous projects. This is a model that could serve as a source of inspiration for all Aboriginal communities. 1. Many municipalities in Quebec’s north depend on the tax revenue generated by the development of natural resources. For example, the town of Fermont, in the North Shore region, saw its budget slashed by a little more than a third following the November 2014 closing of the Bloom Lake mine by Cliffs Natural Resources. See in this regard Sylvain Larocque, “Lac Bloom : grosse facture en vue pour Québec?” La Presse, January 29, 2015. 2. André Dubuc, “10 ans après la paix des Braves : les Cris empochent 645 millions chaque année,” La Presse, October 8, 2011. 3. Jennifer David, “Paix des Braves : Looking Back on 10 Years of Challenges, Change and Prosperity,” Eeyoueenou Nation, Summer 2012, p. 11. 4. François Desjardins, “Terrains d’entente,” Le Devoir, August 16, 2004. 5. Website of BlackRock Metals, Communities. 6. Martine Biron, “Entente avec les Cris pour l’exploitation d’une mine de diamants,” Radio-Canada, March 27, 2012. 7. The Canadian Press, “De l’or dans le Nord – Goldcorp et les Cris s’entendent pour développer le projet Éléonore,” Le Devoir, February 22, 2011. 8. Ken S. Coates, Sharing the Wealth: How Resource Revenue Agreements Can Honour Treaties, Improve Communities, and Facilitate Canadian Development, Macdonald-Laurier Institute, January 2015, p. 23; Jody Porter, “First Nations must ‘learn from’ De Beers deal,” CBC News, February 13, 2013. 9. Hugo Fontaine, “Uranium : Les Cris veulent être entendus,” La Presse, January 19, 2013. 10. Anne Cazin, Augustin Ependa and Andréanne Sauvageau, “Enquête sur les Relations Économiques entre les Autochtones et les Entreprises de l’Abitibi-Témiscamingue,” Secrétariat aux alliances économiques de la nation crie – Abitibi-Témiscamingue, December 2006, p. 24. 11. Guy Bourassa, “Mine Whabouchi et usine de fabrication d’hydroxyde et de carbonate de lithium,” Nemaska Lithium, October 2, 2012, p. 7. 12. Gilles Gagné, “Parc éolien d’Escuminac : les Micmacs comme actionnaires principaux,” Le Soleil, February 17, 2014 (online). 13. Resolute Forest Products, “Resolute’s Opitciwan Joint-Venture Sawmill Wins Aboriginal Forest Products Business Leadership Award,” Press Release, September 23, 2013. 14. Émilie Meloche-Turcot, “Vivre ou non dans les communautés des Premières Nations québécoises? Évaluation de l’impact des inégalités socioéconomiques sur le phénomène de migration des Indiens inscrits,” Master’s thesis, Université de Montréal, August 2012, p. 38. 15. For Quebecers as a whole, the average was 60.1%. See Institut de la Statistique du Québec, Travail et Rémunération : Annuaire québécois des statistiques du travail – Portrait des principaux indicateurs du marché et des conditions de travail, 2002-2012, Vol. 9, p. 123.